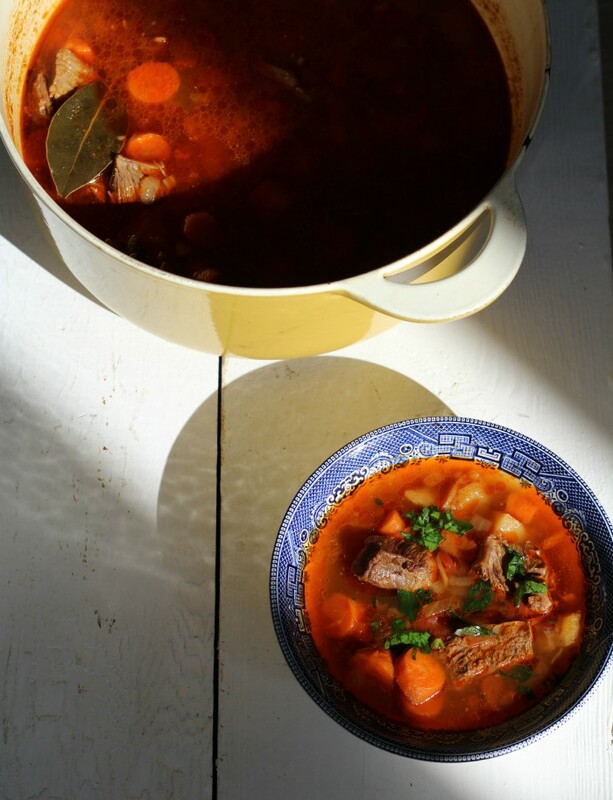 Today we are sharing a wonderful Hungarian Goulash Soup (Gulyásleves) that is true comfort food. It is a simple soup that is a delicious beef soup with a rich paprika seasoned broth. It is the most perfect soup to enjoy on a cold winter’s day. This is a soup that I have been making for most of my cooking life. It was something I made more often before I got married. My mother is from Hungary and there are some dishes from my childhood that spark the most profound food memories. This Hungarian Goulash Soup is one of them. As my mother married a Sicilian, she mostly cooked Italian and Sicilian recipes during my childhood. Many people even thought she was Italian, as her dishes were made just like an Italian mamma would make them. She even learned to speak the Sicilian dialect. But there were those days when she would cook something from her Hungarian childhood, and this is one of those special recipes I learned to cook from her. I have only been to Hungary a handful of times but it is a part of me and a part of my food culture. It was at the beginning of the month when I found half of my household fighting the dreaded flu. I was homebound cooking mostly chicken soup and very light dishes. One day I asked my husband if I should cook another pot of chicken soup and he said to make instead a beef soup. This was the first thing that came to mind and I realized I never shared the recipe here. It also seems I hadn’t made this soup in quite a while. Our son was quite in love with this soup and after chicken paprikas, this is now his next favorite Hungarian dish. Although I can’t compete with mom and her chicken paprikash (paprikas csirke). I will soon share her recipe here. But for now, back to this delicious soup! 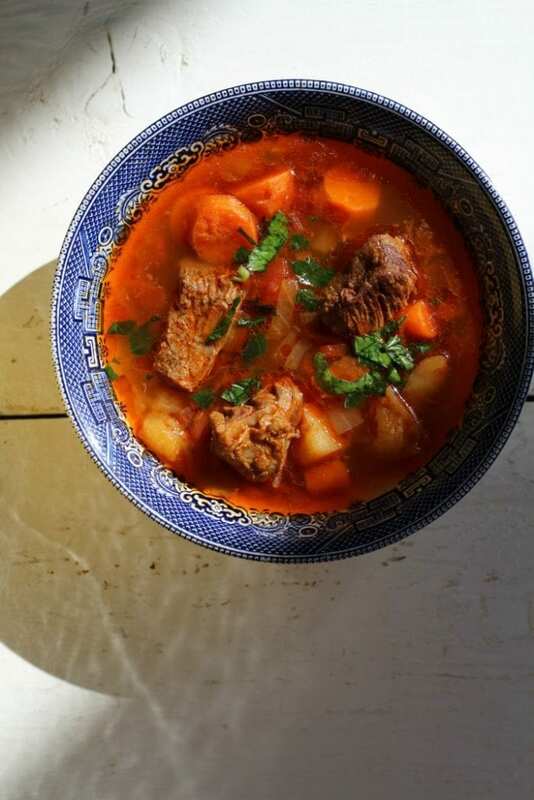 I’m sharing today a recipe that some could consider Hungary’s national dish: gulyás (goulash). Gulyás means “herdsman” and this recipe’s origins dates back to the the nomadic Magyars of the Middle Ages. The herdsmen would cook their meals in a cauldron on an open fire during their long journeys of herding cattle. 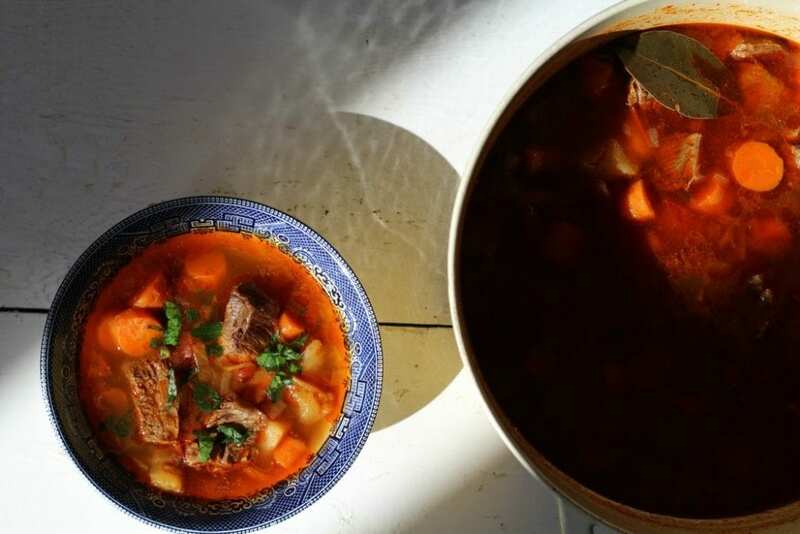 At the end of the 19th century a goulash became not just the soup of herdsmen; it also represented a connection to Hungarian’s identity. This simple herdsman’s soup was one way of preserving a part of their cultural heritage. As with any country’s cuisines, there are variations of a goulash. There is the csángó goulash that is made with sour cream and rice. Another variation is the Kolozsvár that is made with cabbage. The Szeged (or Great Plain) version includes kale with mixed vegetables. In the csikós-goulash instead of the csipetke (pinched dumplings) they use vermicelli. And even one more version uses csusza-pasta. Now if you would ask my mom what is her tip to making the best Hungarian Goulash Soup, she would say don’t skimp on the quality of paprika. I have been lucky to always have high quality paprika in my cupboard. If you can get a hold of some, it makes the flavor difference. She would also say to not be afraid of the quantity of the paprika you use. Another tip she has taught me is to add a little bit of water when you add the paprika when you are stirring with the onion so it won’t burn and get bitter (I’ve had it happen and bitter paprika is awful…you have to throw it out and start over again with the oil, onion, paprika part of the recipe if it happens). What is the difference between Hungarian Goulash Soup and Hungarian Goulash Stew? The thickness is the most important difference between a goulash soup and a goulash stew. Less water is added to a goulash stew than to a goulash soup. A Hungarian Goulash Soup is made with either beef, pork, or veal. Is there more than one way to make a Hungarian Goulash Soup? Just as with many dishes, there are variations. As long as you have the basics of water, your meat, paprika and the vegetables, you will make your own delicious Hungarian Goulash soup. It’s fine if you don’t add some other ingredients you may see on some other recipes. I have seen the soup served with the traditional Hungarian dumplings (nokedli)and I have seen it served without them. It’s up to you. I have also seen it served with Hungarian csipetke (pinched noodles). Paprika is made from grinding up dried peppers. Peppers can range from hot to mild, so paprika will vary from region to region. Paprika is used as a garnish in American recipe. It is used to flavor many Hungarian recipes. Paprika can be sweet, mild, smoked and strong. Mild to sweet paprika is mostly used in Hungarian recipes. 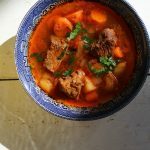 A wonderful Hungarian Goulash Soup (Gulyásleves) that is true comfort food. It is a simple soup that is a delicious beef soup with a rich paprika seasoned broth. It is the most perfect soup to enjoy on a cold winter's day. In a large soup pot, sauté the onions in vegetable oil over low heat, stirring frequently, until translucent. Do not let them burn. Salt lightly to help tenderize them. If they begin to stick, add a bit of water to the pot. Remove the pot from the heat, add the sweet Hungarian paprika, stir. Add the tomatoes, meat and pepper; stir again. Add a little bit of water (about 2 Tablespoons). Be sure to not burn the paprika, as it will get bitter. Add 6 cups of water. Toss in the bay leaves and crack in some fresh pepper (to taste). Add some salt (I start with less, about 1 teaspoon. I add more as it’s cooking if I feel it needs it). If it seems too thick, add another 1-2 cups of water. Reduce heat, add the carrots and potatoes. Cover and simmer until meat is tender, adding water as necessary. It takes about 1.5-2 hours or until tender. If while simmering the soup seems too thick, add a little bit more water so it's the consistency you like. It's been ages since I had Hungarian goulash! This looks delicious! My mom used to make this all the time growing up. Definitely brings back memories! I just made goulash for the first time last week, but yours looks better! Thanks for sharing! I've had goulash many times, but never in soup form. Looking forward to trying this! What a great comforting dish! I want to warm up to it! I gotta make this! Looks great! This looks absolutely delicious! Yummy!